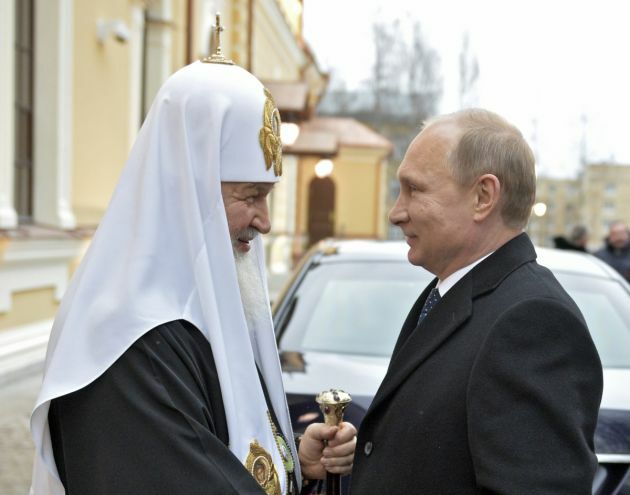 (Photo: REUTERS / Alexei Druzhinin / RIA Novosti / Kremlin)Russia's President Vladimir Putin (R) speaks with Patriarch of Moscow and All Russia Kirill during a visit to St. Sergius of Radonezh Cathedral in Tsarskoye Selo, outside St. Petersburg, December 8, 2014. After a Russian court sentenced a Jehovah's Witness to six years in jail, human rights activists have warned the case will start a crackdown on other religious minorities. Dennis Christensen from Denmark on Feb. 6 became the first Jehovah's Witness convicted for extremism after Russia's Supreme Court banned the religious group in April 2017, The Moscow Times reported. "We will see a wave that will target not only Jehovah's Witnesses after this," he noted. President Vladimir Putin in December called the labeling of religious groups as extremist "complete nonsense." The persecution of the Jehovah's Witnesses group has, however, continued. Armed police detained Christensen, a 46-year-old builder, in May 2017 at a prayer meeting in Oryol, some 200 miles (322 kilometers) south of Moscow after a court in the region outlawed the local Jehovah's Witnesses a year earlier, Reuters reported. In Geneva, on Feb. 7 UN High Commissioner for Human Rights Michelle Bachelet said, "We are deeply concerned about the sentencing in a Russian court on Wednesday of a Jehovah's Witness to six years in prison on charges of 'organizing the activity of a banned extremist organization.'" Dennis Christensen was detained in May 2017, a month after Russia's Supreme Court declared the Jehovah's Witnesses to be an extremist group. The court accused Christensen of continuing to ensure the work of the organization in Oryol, in the west of the country, despite knowing it had been banned. Criminal cases have since then opened against more than 100 members of the Jehovah's Witnesses, including at least 18 who in pre-trial detention said the UN rights office. Others have been subjected to various measures of restraint, including house arrest and travel restrictions. At the Moscow press conference on Feb. 8, Alexander Verkhovsky, the head of the Moscow-based SOVA Center which tracks extremism, noted that six additional Jehovah's Witnesses had been charged with extremism since Putin made the comments. "[Christensen] was convicted for his faith," Yaroslav Sivulsky, a representative of the European Association of Jehovah's Witnesses, said. Sivulsky explained that there are 24 Witnesses currently in jail awaiting trial in Russia. Another 5,000 people have fled the country for fear of persecution, he said. Human rights activist Lev Ponomaryov, who was sentenced to 25 days in prison over a Facebook post in December, said at the conference that Russia was in a state of human rights "chaos." "Putin wants an authoritarian regime," he said. "But who is listening to him?" Bachelet said, "The harsh sentence imposed on Christensen creates a dangerous precedent, and effectively criminalizes the right to freedom of religion or belief for Jehovah's Witnesses in Russia." The action contravenes "the State's obligations under the International Covenant on Civil and Political Rights." Russia is a signatory of the covenant and says it is in force. Various UN human rights bodies, including the UN Human Rights Committee and UN Special Rapporteurs, have raised similar concerns in recent years. "We urge the Government of Russia to revise the Federal Law on Combating Extremist Activity with a view to clarifying the vague and open-ended definition of 'extremist activity,' and ensuring that the definition requires an element of violence or hatred," said Bachelet. "We also call on the authorities to drop charges against and to release all those detained for exercising their rights to freedom of religion or belief, the freedom of opinion and expression, and the right to freedom of peaceful assembly and association." Christiansen had pleaded innocent, saying he was exercising freedom of religion guaranteed in Russia's constitution, according to the Reuters report. The U.S.-headquartered Jehovah's Witnesses has faced pressure for years in Russia, where President Vladimir Putin champions the dominant Orthodox Church. Orthodox scholars have cast the Jehovah's Witnesses as a dangerous foreign sect that erodes State institutions and traditional values, allegations rejected by the Witnesses.